Practice Owners, Let’s Be Honest… This Is A BEYOND CRAZY Time of Year!! Patients are squeezing in before their insurance resets, half your staff is on vacation, you have your own family to think about… you’re overloaded and overextended. The last thing you need is another project, right? If you let the new year pass before making key investments and business expenditures, you will end up paying taxes on money you could have invested tax-free. 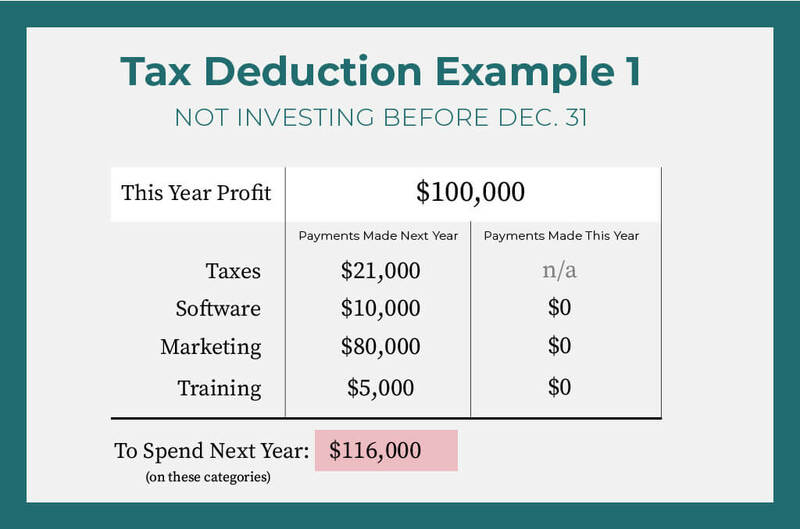 Instead of paying Uncle Sam more of your hard-earned money, you need to decide before the end of the year what tax-deductible services you could pay for now that will both benefit your practice next year as well as save on your tax bill. I’ll also use the corporate tax rate, but remember pass-through businesses such as LLCs have different rates. 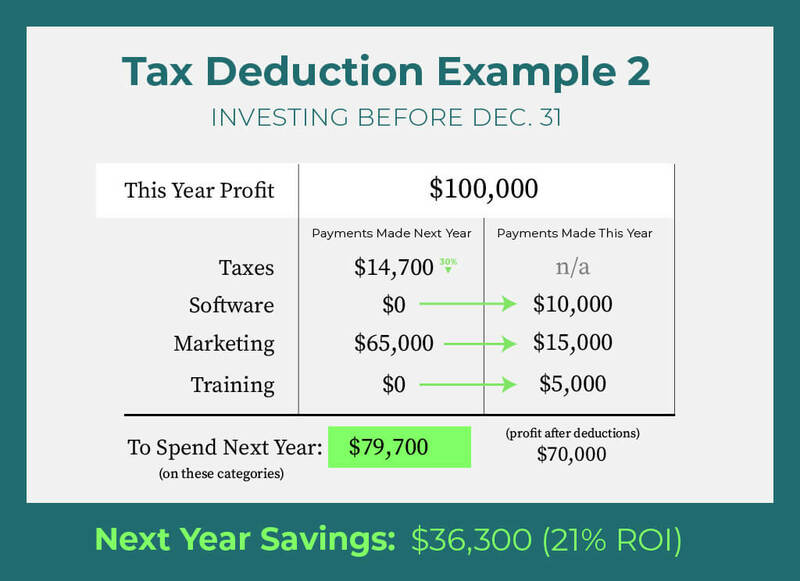 By investing this year, he saved $36,300 next year for an ROI of 21%! That’s more money into helping your patients and less to the IRS. In fact, if you were using our top-tier marketing system, the 30% difference in taxes in this example ($6,300) would cover almost 6 full months! Of course, not every private PT practice will be able to invest large portions of their profit, and that’s understandable. That said, it still makes sense to do what you can to reduce your tax liability. If you have to choose just one or two areas, remember the difference between investments and expenses. Choosing to invest in something that will bring you more patients and revenue will make next year better than simply upgrading your furniture. In order to qualify for tax deductions, your payment needs to be made by the end of the year. Depending on the vendor, it could take time to get started and you’ll be battling vacations, so it’s best to get rolling as soon as possible. How Do You Pay Marketing In Advance? While you can’t pay each month’s postage or online ad fees right now, most subscription-based tools allow you to pay annually including our Ultimate PT Marketing System (which includes web design). Taking care of these subscription and setup costs allows you to both start the year with a BANG and save your monthly budget for printing, distribution, or special promotions. In addition, the Ultimate system that can reduce your time spent marketing next year and increase your weekly patient volume by as much as 100%. What Better Investment Is There Than More Time And Stability In Your Practice? And I know… you’re way too busy to implement a new tool, right? 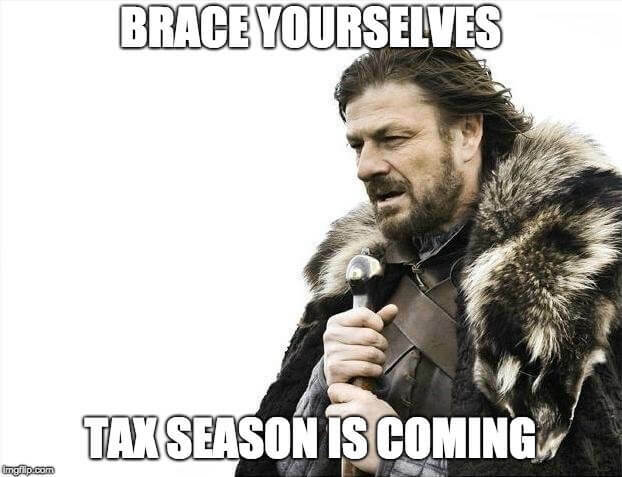 But, if you’re serious about new patients and want to save with tax deductions, our team can get you started with just a few minutes per week or even work with your staff to speed things up. and Change More Lives with Your Stellar Treatment! Will this be the year you realize your practice dream?